Remember the ARCHOS GAMEPAD which was announced a few months back?? The Gamepad is now available for sale in the European Markets. It is priced at 150 Euros, approx. $194. It will be available in the U.S. By the 1st Quarter of 2013. 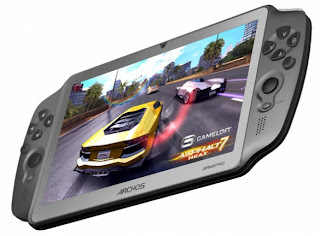 The unique spec about this gaming tablet is the mapping tool app you can use over other games to “map” your own button configuration to the tablet’s physical buttons and play which we call the ARCHO'S BUILT-IN CONTROLLER. It is quite different from other gaming devices. It is a complete Android device featuring Android 4.1 Jelly Bean OS.It sports a 7-inch capacitive screen with a resolution of 1024 x 600pixels. It is powered by a 1.6GHz dual-core CPU and a quad-core Mali 400 MP GPU bundled up with 1GB of RAM and 8GB internal memory with microSD for expansion. The tablet has a total of 14 physical buttons, dual-analog sticks and is all packaged together in a body that is just 10mm in thickness and weighs only 330 grams. It also has a mini-HDMI port for projecting the tablet’s content onto an HDTV. Don't you think with all those features aboard, the ARCHOS GAMEPAD is the perfect on-the-go Gaming Console?? Keep reading for further updates and yes, do leave your comments below..
0 Respones to "ARCHOS GAMEPAD Hits the shelves of the European Markets"